The editors of Model Airplane News Debra Cleghorn and Gerry Yarrish are back from Top Gun 2015, and have all the news! 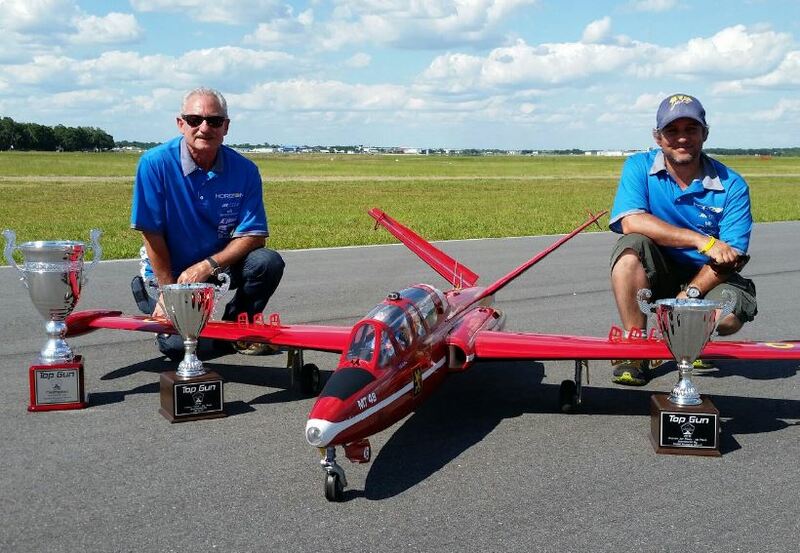 Placing first in the Expert class and also earning the High Static award this year with a near perfect score of 99.167, veteran Top Gun competitor Jack Diaz (left in main image), has won the 2015 Top Gun event and is the newest world class RC scale modeler and pilot to earn the title Mr. Top Gun. His impressive 1/4.5-scale Fouga Magister was a knockout in its all red paint job and Jack built the jet from the Philip Avonds kit. The paint scheme is from the 2005 Belgian Air Force Red Devils Solo Display aircraft. Jack’s radio is a Spektrum DX 18 with JR servos and his turbine engine is a Kingtech 100. On the ready pad for another flight round.